We operate from the beautiful grounds of the Sudbury Yacht Club on Lake Ramsey, just across from the Science North. 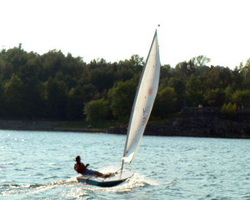 Safety comes first when on the water which is why our instructors are certified by the Ontario Sailing Association. To provide instruction in sailing for people of all ages and abilities in a fun and safe environment. We see the sport of sailing as an opportunity to develop self-confidence, personal responsibility and teamwork skills. We promote water safety, active participation in sport and the appreciation of our environment. RESPECT of others, procedures, rules and our equipment; be a good sport! TEAM WORK because it is a lot more fun! INCLUSIVENESS because each person has unique abilities, and everyone can learn. The yacht club is grateful for a significant grant from The Trillium Foundation. This has allowed us to renew our Sailing School fleet in 2012 so that we can offer safe functional equipment to be used for the instruction of our students.